Tuscany Silk bonded batting is made from imported silk filaments with the addition of 10% polyester. It is then carded and resin bonded to help retard bearding (fiber migration) and allowing the batting to be handled like a blanket. It can be quilted up to 4" apart and hand washed in tepid water and laid out to dry flat. It will likely shrink approximately 5%. 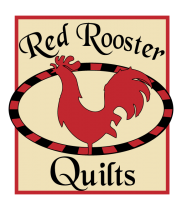 Because of silk's natural ability to breathe, it is an excellent choice for airy, light weight quilts and coverlets. 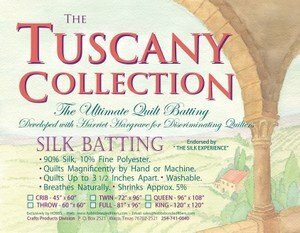 The Tuscany Silk batting quilts magnificently by hand or machine and is a superb filling material for embroidery. King size: 120" x 120"
There will be a $ 4 shipping charged added to this item.